(Newser) – The cyclone that slammed into southern Africa last week has created a slowly unfolding disaster that could be among the worst in the Southern Hemisphere's history, aid workers say. The official death toll from Cyclone Idai in Mozambique, Malawi, and Zimbabwe is below 400, but more than 2.6 million people were affected and the true toll may not be known for months, the Guardian reports. Emergency workers say continuing heavy rains have caused the region's worst flooding in more than 20 years, reports the AP. In Mozambique, flooding has created "inland oceans extending for miles and miles in all directions," says Herve Verhoosel of the United Nations' World Food Program. "This is a major humanitarian emergency that is getting bigger by the hour." 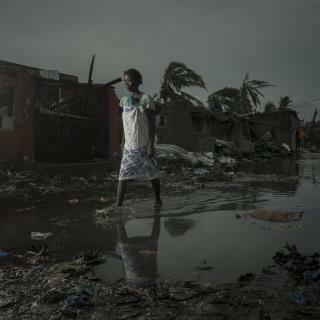 Beira, a port city in Mozambique with a population of 500,000, has been devastated and is cut off from the rest of the country. I'm tired of hearing about disasters. There's a new one every week. In those weeks in which there is no disaster, there's a new mass shooting, or a priest or politician is caught with his pants down. I was in south China along the coast just after a cyclone hit. I was on a bus driving around a big gulf and could see the ocean most of the time. But at one of the points where I couldn't see it, I look out the inland side of the bus and saw a medium ocean liner sitting in a farm field. The propellers were 50-60' in the air had to be 20-30' wide. Everything seems to be getting worse and more frequent.